I was recently asked why most of my colonial wargaming is set in Africa, and why I seemed to have ignored the North-West Frontier. The reason I gave was quite simple ... I have yet to find a method of producing hills and mountains that both look right and that model soldiers can stand up on. I have tried many methods, and each has its advantages and disadvantages. My first attempts were very traditional stepped hills. They were made from plywood (to give a rigid base) and cork (to give thickness and texture without being too heavy). They were painted with a textured paint and patches of flock were added. A 'rugged' hill. The same method was used to produce 'smooth' hills, which were much easier for troops to climb. My second attempt used the thick cardboard end pieces that came in laser toner cartridge boxes. They were vaguely hill shaped, and once given a bit of internal strengthening (using balsa wood), they were stuck on thin plywood bases and flocked. 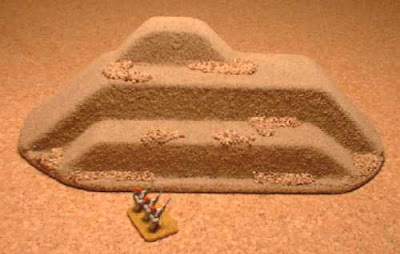 This type of hill was simple to make and very light to carry around, but although troops could stand on them, there was no obvious way for them to get up or down. My most recent attempt used blocks of balsa wood shaped into hill profiles. These were similar in concept to the profile mountains featured on Major General Tremorden Rederring's website that I copied when I tried to create some mountains (see below). The balsa wood made these hills light and quick to make. The slopes were rather steep, and on this hill troops slid down them. The stepped appearance did, however, give some indication as to how troops could ascend and descend the hill. All of these hills can support troops standing on them, but only the first and last look like the troops have some method of getting up and down them during a battle. If hills can be difficult to model, mountains are almost impossible! The only method that I have found that allows troops to stand on the mountain, has a means by which the troops can get up and down it during a battle, has some height so that it looks large, and yet does not take up a huge amount of space on the battlefield was to copy the profile mountains originally created by and featured on General Tremorden Rederring's website. Profile mountains ... in profile. Mine were made out of thin plywood (for the vertical profiles) and balsa strip (for the spacers/steps). They were then fixed to a thin plywood base, painted with textured masonry paint, and flocked. A pair of profile mountains placed back to back. The view from this direction is somewhat less convincing. They look very convincing when seen in profile, but less convincing when seen from the side. An example of a singe profile mountain. The steps allowed troops to ascend to and descend from the middle levels of the mountain. Despite these aesthetic disadvantages they worked well on the tabletop, but I eventually passed them on to another wargamer because I had trouble storing them. I currently have and use Hexon II terrain for a lot of my wargaming. These commercially available hills and mountains are light and easy to store. However, although the hills can easily support troops, the mountains cannot. This makes it very difficult to fight battles in mountainous areas where one or both sides might wish to fight on the mountains. British troops advancing up a valley between Hexon II mountains. As yet I do not have an answer to this problem ... but one solution might be in several storage boxes in my wargames room ... Heroscape hexed terrain! Before we moved I had made a number of the Major General's mountains . . . and I really liked them. They are great backgrounds for photos; are wonderful for Pathan snipers and, as you say, take up very little table space . . . but they ARE a bit difficult to store. Obviously the representation of hills on a wargames table is a problem almost as old as the hobby itself. I suppose we all must just "pay our money, and take our choice". 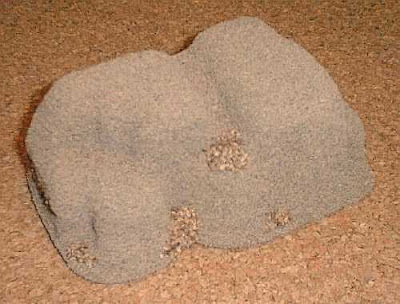 For simple convenience (and because I have no-one else to please) personally I prefer stepped hills to the more realistic kind, though I have recently been experimenting with foam hills made from sheets of wall insulation I picked up at a local "Wicks" DIY store. PS I love those mountains. Interesting article and certainly gives food for thought. The Profile mountains are a novel idea - perhaps best employed on the edges of the playing area! It is something I need to consider for the NW Frontier and will need more research on my part methinks - so it will be back to the Malakand Field Force for me! Certainly the third hill looks like it optimises appearance and gameplay. I'd seen something like those mountains before. I had been dubious, but they do look very good with figures on them. I have not quite decided what I am going to do about modelling mountains as yet ... but I suspect that I will be using the Major General's profile mountains again, if only for the backdrops. What I am wondering is if there is some way in which the advantages of stepped hills and mountains (i.e. easy of putting troops on to them and obvious paths that they can use) can be combined with the advantages of profile hills and mountains (i.e. greater height and less 'footprint' on the tabletop). If an answer can be found to this conundrum it would solve quite a few problems. Certainly the profile mountains do look good on the table edge, but the Major General did use them back-to-back in the centre of the battlefield to great effect. And don't forget, it was your question about why I did not game the North-West Frontier that started this particular ball rolling! I am glad that you liked what you saw, and that you are considering the advantages of profile hiils and mountains. As I seem to be rapidly reverting to the "old school" gaming of my youth, its going to be books under a blanket for hills! The old ways are sometimes the best! My problem with using old blankets when I was young was that invariably somebody was sleeping under them! The "books under the blanket" approach can actually work really well for "broken terrain" such as is found on many Colonial battlefields. Of course it need not be books under the blanket . . . I've used stacked styrofoam cut to shapes (and masking taped into a single piece) to great effect. Yeah, often those old techniques are very good.